Wear the Pegasus Boots to cross the Wilds to the left, then down. Climb the vine, then cross the bridge northwest. Go down the vine and get in the cave. Go down the stairs, go left, then up. Be ready to fight a Darknut! His weak point is his back, be fast and attack him as soon as he deals a blow. After hitting him four times, he will let you open the chest which is withholding a Golden Kinstone. Get out, climb the vine and go on to the northeast. Go down, go west and cross the Wilds from the west. Shrink on the stump, then go through the empty log and cross the water area with the Gust Jar. Get into the hole, get rid of the enemies and pick up the Bow from the chest (along with 30 arrows). Get out, get back to your size and go back east. Go north and shoot an arrow at the eye of the statue. Climb the vine behind it, then jump into the tornado and fly southwest. Walk south until you reach a tombstone, then cross the Wilds to the east. Look at the stele to the south, then shoot an arrow at the eye of the statue. Climb the vine behind it, cross the bridge, then jump into the tornado and fly southwest. Get in the cave and open the chest to get another Golden Kinstone. Get out, push the rock, push the next one to the north, and climb the next vine. Cross the bridges to the northwest, the northeast and the southeast. Go down the vine, shoot an arrow at the statue to the right and go behind it. Go northwest and get in the cave. Open the chest which contains the third Golden Kinstone. Now go back all the way to the south of Castor Wilds, then cross to the west. Get close to each statue and fuse the Kinstones with them. This will destroy a big rock. Go on to the next region. Climb the stairs, go south, wake up the statue by touching it and get behind it or get rid of it. Go down the stairs, shrink on the stump and get in the small hole. 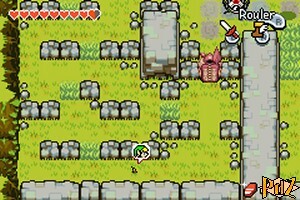 Talk to the Minish, pick up a Kinstone from the chest and get out. Climb into the statue, switch the lever, then go back to your size. Wake up the statue, then go on south and east. 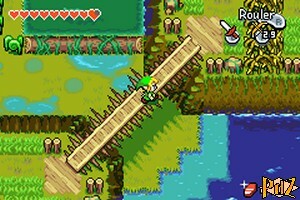 Climb the stairs, get rid of the enemies, climb the rope stairs, then the next stairs and go right. Start by getting rid of the snakes, then shrink, wake up the statue and go back to your size. Get past the statue and go south. Wake up and get rid of the three following statues, then open the two chests to gather 50 mysterious shells and 100 rupees. Next, shrink, climb in the fourth statue and switch the lever to turn it off. Go back to your size and go south. Go on east, then north and break the blocks to get rid of the hidden enemies. Go north, climb the stairs and enter the dungeon.